Facts and information about the History and Warrior Culture of Native Americans including the subject of War Paint. Many of the Pictures and Images of Native Americans on this website depict Indians with full war paint in different shapes, colors, symbols and designs. Each tribe had its own designs and painted their bodies and faces for rituals, dances and for battle. Discover how war paint was made and applied and the meanings, symbolism and reasons it was worn. Many of the pictures and images of Native Americans depict the Indians in full war paint. 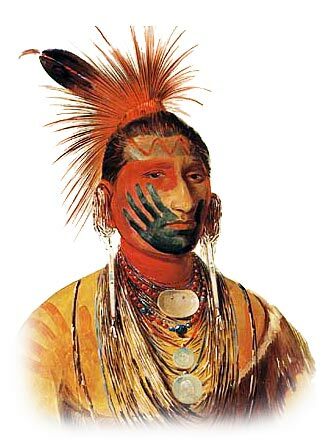 Many tribes of Native Americans painted their bodies and faces for rituals, dances and for battle. The designs painted were believed to hold magic powers for protection. Colors and images were also used to make the warriors, chiefs and braves to look more ferocious. Their objectives were achieved! Native American Indians even painted their horses and ponies decorating them with with war symbols or symbols of power, see Horse War Paint. The following types of symbols can be see in the above picture depicting the War Paint on the Iowa warrior. Hand print meanings. The Hand Symbol indicates that the warrior has been successful in hand-to-hand combat. The zig-zag line meaning across the forehead symbolizes lightning which was believed to add power and speed to the warrior. The Great Plains Indians culture abounds with many more examples of this usage of symbols and their different meanings. For more, meanings, facts and info see Native American Symbols. War Paint. Discover the vast selection of pictures which relate to the History and Culture of Native Americans. The pictures show the clothing, War Paint, weapons and decorations of various Native Indian tribes that can be used as a really useful educational history resource for kids and children of all ages. We have included pictures and videos to accompany the main topic of this section - War Paint. The videos enable fast access to the images, paintings and pictures together with information and many historical facts. All of the articles and pages can be accessed via the Native Indian Tribes Index - a great educational resource for kids.